24 May From Delight, to Despair, to Optimism. Ok, there is a story that doesn’t need to be written, but contains details that some of you might find interesting, and also, may serve to help others from what we learned. This will be long, so we suspect that many, in fact most of you won’t read it through. For those who think you might, STOP right here, grab a beer, glass of wine, cup of tea, or just take a comfortable seat and join us for a journey in time, stress and learning. Back in December 2016, we were elated to have hatched a Martial Eagle egg. DNA sexing fom the egg remains, left us even happier, knowing the chick was a (very scarce in captivity) female. On December 28th, we turned on the previously installed under nest heater, and returned the precious chick to its parents for full term natural rearing in a fully secluded aviary. Terrified though we were, the adult female eagle tended the chick with huge devotion, seeming to understand the Scottish winter temperature concerns for a tiny chick of an African species. Dad, although pretty hopeless with the direct attention to temperature that the chick needed, did do a super job of providing constant food to the nest, meaning that Mum never had to leave for long. Mum covered the males brooding shortfall, and the chick thrived. It grew, and grew and grew. It was a genuine thrill to see the chick on the CCTV constantly developing both in terms of physicality and mental development. Through the frozen months of January and February and even most of March we enioyed observing the continually developing youngster. Our early spring work load began to increase, and we settled into a regime of feeding the aviary through the food chute and taking a look at the CCTV during finger warming tea breaks, hoping to see the moment the baby fledged. Only minor concern, more of a kind of mental wrinkle in the bed sheets occurred when as 100, 101, 102, 103…. days went past and the baby hadn’t fledged. Then, to our horror, on April 2nd, we witnessed the baby eat on CCTV, and then regurgitate the food immediately. She re-ate the meal, then regurgitated again, and ate it again. In all, she ate and regurgitated 5 times! Our hearts skipped enough beats to make us break sweat and perhaps a little wind! Implanted for the rest of the day, we scoured back through every moment of CCTV and were horrified to discover that the bird had regurgitated once, for the first time as far back as March 24th. Subsequently from there, she infrequently, but regularly regurgitated food almost every day. It’s easy to say that you can’t watch CCTV 24/7, and with a healthy looking 3 month old eagle, about to fledge, and all food disappearing from the shelf, you have no reason to monitor 24/7. We were distraught though to realise we had missed those crucial few minutes in each day for a week! Our mentally wrinkled bed sheets had become a scene from the Exorcist! 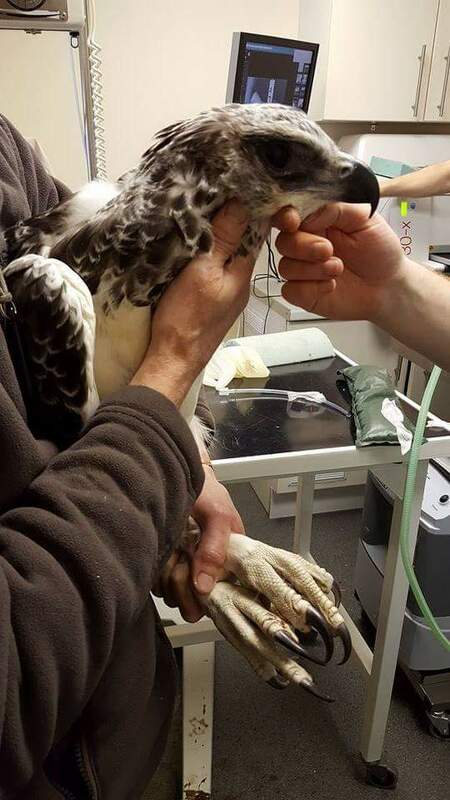 Not knowing the cause or impact of the regurgitation, we had emergency discussions with our raptor specialist vet Sam Kerr (a former understudy of the phenomenon of raptor vet that is the (now retired) Alistair Lawrie) at Apex Vets in Denny near Falkirk. A decision was made to take the grave action of removing the young eagle for emergency exploration. Leaving aside the risk to the youngster, this decision is taken very seriously because the adult male is a seriously crazy bird, and risks huge damage to himself if anyone enters the aviary. Luckily, on this occasion we caught him with no incident or injury. Baby eagle caught and boxed, we journeyed the hour to Apex Vets. A quick physical exam revealed nothing, so a decision was taken to anaesthetise the bird. Little did we realise that 5 1/2 hours later we would be only then hoping she would wake up! X-Rays showed a small amount of food in the birds crop, but (as can be seen in some of the pictures below) a stone was stuck in the birds proventriculus. With some thought to whether this was a cause of the regurgitation, or a symptom of whatever was causing the regurgitation, it remained clear that this stone needed to come out! An operating theatre was rapidly set up, and an endoscopic procedure began. Firstly, some fairly fresh food was scavenged from the crop. Then some very nasty, foul smelling, rotting meat was recovered from the proventriculus which had backed up against the stone. Then we reached the stone. On the monitor the stone was a huge meteorite, but X-Ray technology is clever nowadays, and we knew it was just 1.53cm x 0.93cm. Sam and the team rallied around him including the practice owner and a hero of an anaesthetist, worked and worked, but pushing endoscopic equipment to the limit, the stone would not budge! Sam had to make the decision to incise the crop, and go into the proventriculus manually to try to recover the stone. Leaving us to fret over how the stone got there, Sam begun the procedure. Remember the bird had NOT fledged, and there are no stones on the nest, we had to accept that the stone had been delivered there by one of the parents who must have dropped food onto the aviary floor (pea gravel substrate), picked it back up, and delivered it to the baby who subsequently ate it. Quite a set of circumstances, but the only plausible explanation. Sam worked hour upon hour, but short of carving the proventriculus open (an enormously dangerous procedure considering the route the vet would have to take to get in) still the stone remained resolutely wedged like Arthurs sword in the stone. Sam was openly honest in that he was at the edge of his comfort zone, so counsel was taken with Alistair Lawrie. His wisdom and experience were heeded, the stone left, crop stitched, and after 5 1/2 hours the bird was slowly, worryingly slowly, brought back around. Discussion, with huge consideration for the birds mental development, settled us on a regime of anti sickness medication, an appetite stimulant, antibiotics, liquid food, all administered via a crop tube. For 4 days, this eagle had to live in a large box. Tube fed the above mixture (the liquid food was veterinary a/d mixed one tin with 15ml of CCF powder and 50ml of water, plus a pinch of Raptor Essentials or Nutrobal). The first tube was just 50ml total, and took 6 hours to pass through her crop. Next tube was 60ml, and passed over in 2 1/2 hours and she passed mutes (never have we been so happy to see poo!). Next tube 100ml, and passed in an hour. Increasing volume, speed of passage and motility saw us eventually tubing 120ml per feed every two hours day and night. On the day of the operation, the bird was critically underweight at 4,100 grammes. The tubed liquid diet over 4 days of intensive care had increased her weight by 200 grammes. Still a long way to go, but at least going in the right direction. On April 6th, a follow up appointment back at Apex Vets. Another anaesthetic, another X-Ray. What we saw was that although the stone was still present in the gut, it was now way down, and almost ready to pass out. Mainly though, it had been dislodged from the proventriculus. We figure loosened by Sams work, and flushed by the intensive liquid diet. More plans made, we woke her up, took her home again. Tubed her twice more, and made another working decision to put her back with Mum and Dad. Would they see her as an imposter now and kill her, ignore her, or accept her? To begin with they were ambivalent, then curious, then allayed our fear, and simply took food to her. We truly believed we had turned a corner. Considering her crop had been plucked, cut open and stitched, and had Sams surgical instruments pushed into her proventriculus, not to mention the endoscopic probe that measured at going down 30cm (that’s a foot to those of you as old as me) into her digestive tract, plus 4 days of crop tubing, we knew there could be an issue with some sickness or lost appetite for a day or two. This was something we couldn’t afford considering her low weight, so all food was low dosed with Emeprid (anti emetic and appetite stimulant). No harm would come to the adults if they ate it (and they did) but it should help the youngster along. If you thought we were at a happy ending here and that the mental bed sheets were smoothed, and the Exorcist sent packing, then you should refill your wine glass, grab another beer, and if you were drinking tea, put it aside and grab a scotch. We’re not done yet! She was sick. Again and again and again. Sometimes 6 or 7 times on a single food item. As many as 27 times a day! Her appetite was strong. She wanted to eat, so every time she vomited, she re-ate the food. When she vomited it was within moments of eating so the food was not fouling at all. Unless the food fell to the floor (she had still not fledged and remained on the nest shelf), she re-ate everything. Our only reasons for optimism were her constant appetite, normal young eagle behaviour apart from the sickness, and eventually, she fledged. Fledging was a positive sign. It takes strength, enthusiasm, curiosity. It also took the eagle to parts of the aviary where we couldn’t see so well on the CCTV so our stress went up also notch as clear observation of her progress got harder. On one occasion she flew for the first time to the food shelf for her food. Independence on the way? She ate, then seemed to go into a stupor, and didn’t move for 6 hours. She then laid down on the shelf. We could not let that situation prevail for fear of food scraps causing an infection in her recently stitched crop. We went into the aviary, tubed an additional feed, checked her keel for condition (slightly improved) and put her back on the nest. She stayed on the nest a few days, easy to monitor on camera, sadly still being sick. We experimented with diet. Quail was a disaster. Definitely the most readily vomited. Rats were marginally better. Hare flesh was better still, and big slabs of venison vomited least. The red flesh of venison and hare was best, but rapidly our stock was dwindling. Roxanne remembered that we have in stock some wild geese, shot with steel shot, and used for training some of our other eagles for a goose hunting trip we are planning. That’s red meat, let’s try it. We did. By the time she was on the 2nd day of goose only in her diet, we hit the first day where she ate and did NOT vomit !!!!!! The first day in just under 5 weeks. Time to smooth the mental bed sheets? Well not quite. We couldn’t feed goose flesh only forever, and even on goose, she did still vomit a few times over the next few days, but the incidences were getting less and less. When she did vomit a meal, it was less often and less volume. We were becoming optimistic. After 3 weeks with no vomiting and huge volumes of food going down, and all food types, a discussion again with Sam at Apex Vets concluded that we should see if the weight was going on, and take bloods and swabs to check comprehensively if we were out of the woods. To reduce stress on the eagle, Sam came to us to perform these tests. All staff and volunteers were called in (huge thanks to Hazel, John, Shanna & Rebecca) and the game was on. First we caught and coped Mum & Dad. Then the youngster (while she underwent tests, the team went into aviary cleaning overdrive). She was caught and in a fluid movement feet secured, and a hand to her chest sent the message to my brain that even before blood tests were done or scales turned on, we had a recovering eagle. She felt plump! The scales confirmed that she had gained about a pound and and a half. We’re writing this summary here because the blood results came in from Sam today, and are all clear. This has all taken place during a period when on 3 days a week, some of our work commitments have us up to start our working day at 2.30am or earlier. Day length sees us pushed to get get a summer bird team fit and ready, and other young birds are hatching as the breeding season moves on. It’s been tough, and as you can imagine, expensive on vet fees etc. Every moment though is worth it, and when, at a year old we take the young eagle for training, that you’ll all enjoy a more pleasurable stage of her life. Oh, and her name, looks like it could be Pebbles, referring to the stone in her gut.